Pretty City Dancer (Tapit) and jockey Irad Ortiz Jr.
Irad Ortiz, Jr. added another riding crown to his resume, securing the Aqueduct Racetrack 2017 spring meet title following Sunday's closing day at the Big A.
Linda Rice and Rudy Rodriguez both saddled 12 winners to share the training title. There was also a four-way tie for the leading owners, as Michael Dubb, Midwest Thoroughbreds, Drawing Away Stable and Rodriguez each had four winners. Ortiz, who won the Big A's inner-track title last month, had already clinched the most jockey wins for the spring in taking a 13-win lead into Sunday. He won aboard Bluegrass Hip Hop in Race 5, bringing his meet-leading total to 30 wins from 110 mounts for earnings of more than $1.5 million. 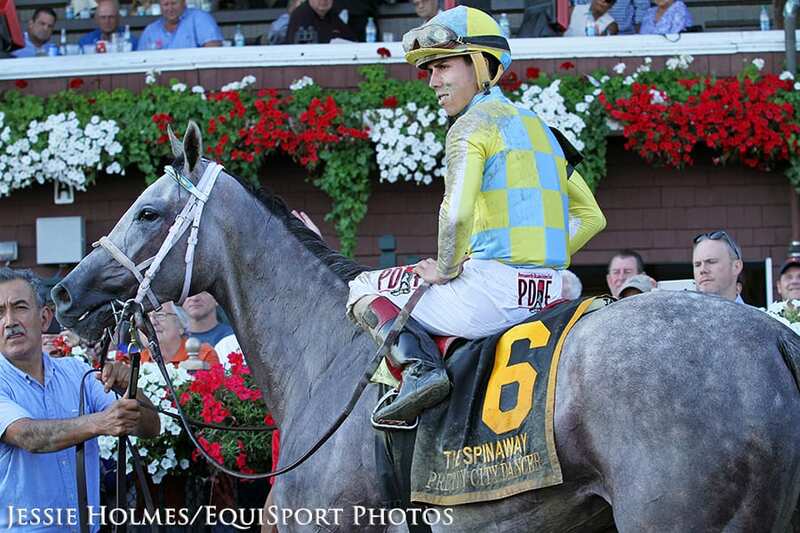 He registered his 12th overall title on the NYRA circuit. Among Ortiz's victories in the spring meet was an impressive effort aboard Mo' Green in the Grade 3, $200,000 Top Flight Invitational on April 2. He also registered a four-win day in the meet's opening day on March 31. Rajiv Maragh finished second in the standings with 14 wins from 79 mounts. His meet was highlighted by winning the Grade 2 Wood Memorial aboard Irish War Cry. Angel Arroyo was third with 12 wins from 62 mounts. Rice recorded her fifth individual meet title on the NYRA circuit, and the first since the 2012 Aqueduct spring, with 12 wins from 34 starters. Her starters notched five runner-up finishes and six third-place finishes. Rodriguez registered two wins on Sunday, with Tug of War in Race 1 and Bluegrass Hip Hop winning Race 5, to pull into a tie with Rice. Rodriguez, who earned the 2016-17 inner meet title, registered his eighth overall individual NYRA meet crown. As a trainer, he had 12 wins from 66starts. He also won four races from seven starts as an owner to share in the lead in that category. This entry was posted in NL Article, People and tagged angel arroyo, aqueduct, Drawing Away Stable, Irad Ortiz, leading rider, Linda Rice, michael dubb, midwest thoroughbreds, mo' green, Rajiv Maragh, rudy rodriguez by NYRA Press Office. Bookmark the permalink.